In Viral Jesus: Recovering the Contagious Power of the Gospel, Ross Rohde offers the Church some answers to these questions. Is this another book we can include in the “deconstruction” of Western institutional Christendom? Yes. Is it just another such book? No—Rohde contributes something new to the conversation by including his insight into viable, organic, Spirit-led ministry that does produce a viral effect in spreading the Gospel and expanding the Church into new “spheres of influence”. He isn’t just theorizing. He’s speaking from experience. Rohde conducts a tour of what a viral Jesus movement looks like. Reading contemporary examples of believers practicing the model demonstrated by Jesus Himself, we can embrace the invitation to follow Jesus into the harvest like Peter and John. Rohde’s “deconstruction” becomes “reconstruction” as he takes the reader back in time to revisit the ministry of Jesus in His incarnation and—after His ascension—through those who followed Him as they carried the “Jesus Virus” out into the Roman world of the first century. For clarity, Rohde uses “Christendom” to describe the institutional religion which bears the Lord’s name, as opposed to “Christianity”—the “little Christs” reality of true followership. Others (cf., Viola & Barna, Pagan Christianity) have already explored the roots of Western Christendom in the Greco-Roman worldview. Rohde goes more in depth in exploring the effects of this Hellenized worldview (in essence, the foundational principles of the world as we know it) and gives additional clear evidence that “church as we know it” isn’t “church as Jesus designs it.” Like a bullet between the eyes, his handling of the material shows that the traditions and structure of Christendom are, indeed, a major roadblock to a viral Jesus movement! Indeed, the reader can here be persuaded that the best efforts of human beings pushing the bus of Christendom vainly forward—even when the best of intentions are behind those efforts—are not going to produce the hoped-for outcome…because Jesus isn’t interested in the destination those pushing the bus have chosen. Where are the signs and wonders that accompanied Jesus and the first century apostles? Rohde addresses one symptom of ailing Christendom that is often overlooked by writers presenting mere programs and methods for church growth or “missional” activity. Pointing to the strains of Cessationism that have invaded the Church like cancer, he refutes the argument that signs and wonders ceased with the passing of the first generations of believers, offering examples from the modern—and postmodern—age. This part of the book struck a chord with me, because I’ve always thought if the Church can believe in Jesus’ resurrection, we should take Him at His word that those who come after Him will walk in the Spirit’s power and that signs and wonders (worked by His Spirit, not in our own power) will accompany them. Rohde’s examples come not only from the mission field of the Third World, but also from the West. After you read this book, you will probably never again see China as anything but First World when it comes to the Kingdom…and you should be expecting to see signs and wonders as part of a viral Jesus movement in your own life. I found Rohde’s analysis of the apostolic model used by Jesus as he sent out the twelve and later the seventy-two to be succinct, powerful, and persuasive. Background reading of Luke 10 (why not all of Luke?) will be helpful before getting into this section. How has Christendom overlooked the simplicity that worked for the Savior and replaced it with all the baggage of institutionalism? Why would we exchange a model that worked for Him and His first followers for something complicated that obviously does not work for the Church today? Declining attendance and membership should be proof enough that this is a valid question. Clearly, relationships—not programs—are at the heart of a viral Jesus movement. Other noteworthy features of this book are the two appendices, dealing with Cessationism and Postmodernism. The former explains how the Cessationist teachings first entered Christendom and continue to prevent the contagious spread of the good news. The latter is especially helpful to those who have trouble understanding the younger generation, and who often wonder what it will take to “get them into the Church”. Need a clue? They want no part of “church as you know it” and as “Christendom” represents it. But they are spiritually open and seeking a real relationship with a truth that “works for them”. Jesus said, “I am the Truth”… but they won’t come looking for Him in your church buildings. I humbly offer my opinion: this appendix can serve as a needed warning, lest Evangelical Christendom forever bind itself into a dying form of religion without the power, engaging in the shaking of heads and clucking of tongues at the “lostness” of those “out there” until it finds itself sitting fully—and abandoned by the Spirit—in the seat of the Pharisee. Jesus is Lord and the New Covenant is the “operating system” of the Kingdom. It’s time to admit that Christianity has been “reduced to information, talents, techniques, and tasks” by the structure and strictures of “Christendom” (Viral Jesus pp. 130-132). It’s time to start “sneezing Jesus” as we return to the exciting contagion that was the early Church. 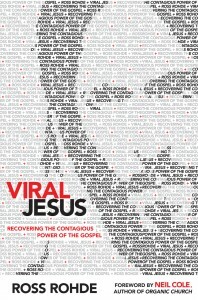 In Viral Jesus, Rohde offers a roadmap back to the Jesus method of ministry that ignites contagious, infectious, rampant, unstoppable Jesus movements. An epidemic is about to break out! The word “revival” will be a real understatement! Disclaimer: Ross Rohde graciously offered to send me a copy of this book in return for a review. It was on my “to read” list anyway and this was a wonderful gesture on Ross’s part, for which my husband is extremely grateful—the wheelbarrow won’t be lighter, but at least we’re a book further from the poorhouse than we would otherwise be. (If you, dear reader, find that remark confusing, see About This Site.) Anyone who is the least familiar with me or the things I read and write shouldn’t be surprised that this is a book I would choose and find “worth reading”. Without any bribe or compulsion to write a positive review, I wholeheartedly deem this one “worth reading”. To put it bluntly, I highly recommend it to everyone who deeply desires to see a contagious movement of the Lord in our day.